Celebrating 57 Years in Business! Now Renting Luxury and Handicapped-Accessible Apartments in Downtown Dekalb! Thanks for visiting the website of Adolph Miller Real Estate. We know the area, the various markets and we are here to help you in all avenues of Real Estate! Remember, we are the office that puts you… number one! We are the ‘George Bailey’s’ of the Real Estate World – NOT the ‘Mr. Potter’s.’ Honesty, integrity, and dependability has helped us outlive and outwork all the big franchises without having to join them. We’ve been in business since 1962 – the longest single family owned Real Estate company in DeKalb County Illinois. 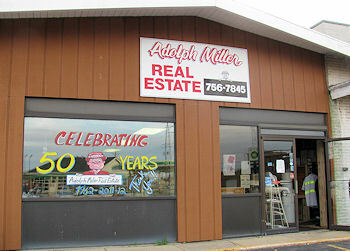 Whether you are looking to purchase, sell or lease, Commercial, Industrial or Residential property, Adolph Miller Real Estate is here to help! Please send us a note or give us a call today!